322 pages | 9 B/W Illus. 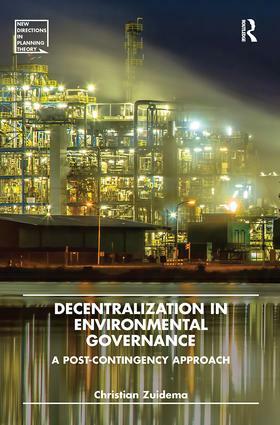 Christian Zuidema skilfully navigates the theoretical and practice pluralism of environmental governance. In worlds plagued by many forms of environmental pollution, there are no ready-made answers. For environmental policy-makers, it is a matter of value preference. Zuidema's persuasive proposal for a consequentialist post-contingency approach offers a proactive way for moving beyond mere damage control, to enable more informed policy decisions. Christian Zuidema is Assistant Professor in Spatial Planning at the Department of Spatial Planning and Environment at the University of Groningen, Netherlands.